Hear ye, hear ye! 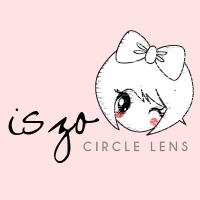 Another giveaway is up and this time, you will win an Iszo Circle Lens of your choice! I am so thankful with Neko who emailed me that they would sponsor 2 pairs for this giveaway! So generous of them! Now before getting on that part, let me introduce to you what kind of shop Iszo Circle Lens is. Iszo Circle Lens sells authentic lenses which are 100% imported from Korea. They also have a wide range of choices. They have over 300 types and colors of designs for you to choose. All lenses are well tested by them before it's on sale. They send stock within 1-2 business day for available items. You have no longer to wait for pre-orders which it might take up to 1-2months for delivery. Plus they also offer free shipping worldwide, without a minimum order. They also have a very friendly customer service that entertains questions, comments, complains, etc. They handle every contact lenses by bubble wrapped and store in a cute gift bag. All goods are sent with paddle pack envelope to avoid damage from delivery to make sure your orders arrived safe and sound. Pretty, right? So kawaii!!! I actually would want to wear one of these lenses only if I can. I was just so afraid to try/do it. haha. To win one, just do ALL the mandatory steps in the Rafflecopter below and have the chance to win these beautiful lenses. Not following instructions will lose your chances of winning. Refer to the Rafflecopter below. Disclosure: The giveaway prize will be shipped directly by the sponsor. That said, I cannot be held accountable for sponsors actions regarding giveaways. I expect them to honor all promises and send winners their prizes; failed delivery of the giveaway item lies solely on the sponsor. I am also not responsible if discrepancies occur between the stated prize and actual item shipped by the sponsor. thanks for the lovely giveaway! more power! Nice giveaway! Would like to have one since I am a contact lens wearer, kaya lang my eyes have a grade of -400. Cute models there. Parang life-sized mannequins lang. Good luck to those who joined. I want to join and also join the Solution-lens giveway, can I post a link here (just need to talk about their giveaway, and maybe I can talk about your giveway there?) Thank you. I love this giveaway! :) Thanks sis! you need to comment on different post sis. ate paano po ? sorry..
comment on other post.. try to click home and view other articles. This is a nice post, I am a big fan of circle lenses and I also have 8 pairs in different colours in my collection.